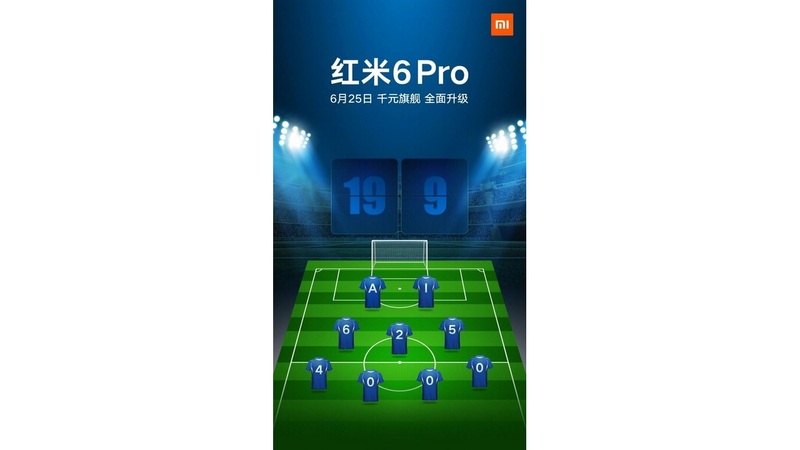 Chinese smartphone maker Xiaomi has confirmed that the company will launch the Redmi 6 Pro and the Mi Pad 4 at an event in China on June 25. The Redmi 6 Pro is expected to be launched with a notch display, making it the first Redmi device to sport a notch. The Xiaomi Mi Pad 4 will be the successor of the popular tablet Mi Pad 3 that was launched in China in April last year. The Redmi 6 Pro was expected to launch along with the Redmi 6 and Redmi 6A in China, but the company decided to launch it along with the Mi Pad 4. Earlier, Xiaomi had launched the Mi 8, Mi 8 SE and Mi 8 Explorer Edition with a notch display and the teaser for the Redmi 6 Pro hints at a notch display. While we know the complete specifications of the Redmi 6 Pro due to its TENAA listing, all we know about the Mi Pad 4 is that it will feature a single rear camera. The Redmi 6 Pro teaser has revealed that the device will sport a 19:9 notch display, which is similar to what was revealed in the TENAA listing. The Xiaomi Redmi 6 Pro is similar to the Redmi Note 5 Pro in terms of design at the back but at the front, it will sport a notch and a bigger chin at the bottom. It is expected to be launched in Black, Blue, Gold, Gray, Pink, Red, Rose Gold, Silver and White color options. If you look at the teaser, you will notice that the players in the field hint at these three words – AI, 625 and 4,000, hinting that the device will be powered by a Snapdragon 625 SoC, 4,000mAh battery and have AI capabilities. The Xiaomi Redmi 6 Pro will run on Android 8.1 Oreo with MIUI 9 skinned on top and may get the MIUI 10 update soon after its launch. It will feature a 5.84-inch full HD+ 2.5D curved glass display with a resolution of 2280 x 1080 pixels. In terms of performance, it is expected to be powered by an octa core Qualcomm Snapdragon 625 SoC coupled with Adreno 506 GPU. In terms of memory, the device will be available in three variants – 2GB RAM + 16GB internal storage, 3GB RAM + 32GB internal storage and 4GB RAM + 64GB internal storage. The internal storage will be further expandable up to 256GB via a microSD card. Coming to the camera department, the Xiaomi Redmi 6 Pro will feature a dual camera setup at the back consisting of a 12MP primary camera and a secondary camera for bokeh effect. On the front, the device will sport a 5MP selfie camera. The Xiaomi Redmi 6 Pro will be powered by a 4,000mAh battery and connectivity options on the device will include 4G VoLTE, Wi-Fi 802.11 a/b/g/n, 3.5mm audio jack, FM Radio, Infrared port, Bluetooth 5.0 and GPS. As mentioned earlier, not much is known about the Mi Pad 4. It is expected to feature the same metal body design as the Mi Pad 3 with stereo speakers up front. It is rumored to be powered by a 6,000mAh battery with 5V/2A charging support. 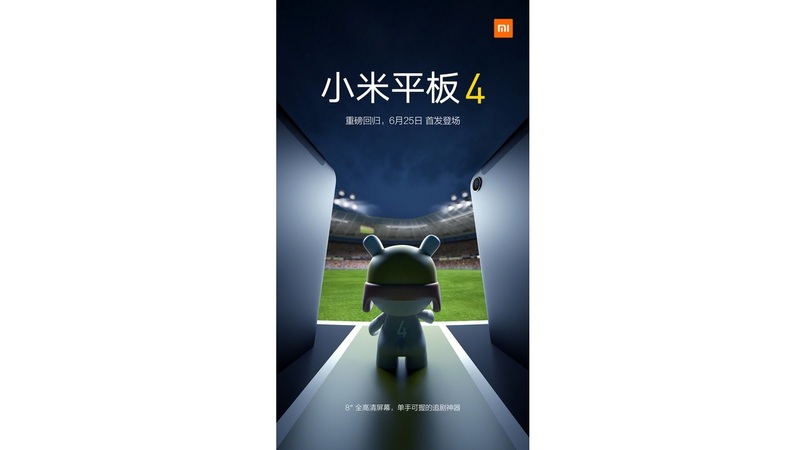 Additionally, Xiaomi is also expected to launch an LTE version of the Mi Pad 4 along with the regular variant. The teaser of the device has revealed that it will feature a single rear camera without an LED flash.